This is what I have found to date from the videos at http://www.solarviews.com . apo11d.mov No ground reflection or brightness is apparent in the shadow from any LM main engine flame as it lands. apo11f.mov The astronaut is bright and visible in the dark shadow of the LM. apo11i.avi The ascending LM gives a quiet and smooth ride. apo11j.mov The LM changes its angular velocity and position without any flame or exhaust visible from any of its sixteen thrusters. apo12b.mov As the LM lands, there is negligible instability from surface effects from all of the exhaust from the main engine. apo14b.mov As the LM lands, there is negligible instability from surface effects from all of the exhaust from the main engine. apo14e.mov The ascending LM comes to a smooth abrupt stop with no exhaust or flame visible from any of the sixteen thrusters. apo15h.mov The LM lifts off with no flame, exhaust, or even engine exhaust shroud visible from its bottom. apo16c.mov As the LM begins rotation, no exhaust or flame is visible from its quadruple thrusters. apo16d.mov As the LM is landing, there is negligible instability due to surface effects from all the engine exhaust. Also, no ground reflection or brightness in the shadow is apparent from any lunar module main engine flame as the LM lands. apo16e.mov The astronaut jumps not more than a couple of feet after flexing his knees to a fair degree. apo16j.mov As the LM ascends, no flame, exhaust, or even engine exhaust shroud is visible from its bottom. apo16k.mov The LM stops and starts rotating with no exhaust or flame visible from quadruple thrusters. apo17c.mov As the LM is landing, there is negligible instability due to surface effects from all of the engine exhaust. Also, no ground reflection or brightness in the shadow is apparent from any LM main engine flame as the LM lands. apo17d.mov & apo17f.mov The astronauts fall hard on the ground. According to an article in the Dec. 1, 1969 issue of Aviation Week and Space Technology, Apollo mission planners were worried about suit puncture and cutting. apo17i.mov The LM ascends with no flame, exhaust, or even engine exhaust shroud visible from its bottom. apo17j.mov As the ascending LM slows down, no flame or exhaust is visible from the quadruple thrusters. The following MOV videos are located at and may be downloaded from the "Video Library" link at http://www.hq.nasa.gov/office/pao/History/alsj/frame.html . a11f.undock.mov The LM changes its angular velocity with no exhaust visible from any of its quadruple thrusters. a11f.1024502.mov The view from the fixed camera on the lunar module is relatively steady, indicating no LM instability due to surface effects from all the engine exhaust. The ground in the LM shadow shows no reflection or brightness from any main engine exhaust flame. a11f.1092654.mov The astronaut is shown very clearly and brightly in the very dark shadow of the lunar module. The shadow of the lunar lander is falling away but there appears to be a bright reflection of the sun on the ground just above the shadow. This would appear to indicate a sun in two different positions in the sky. a11.v1105816.mov - a11.v1102332.mov - a11.v1112404.mov - a11.v1113715.mov - a11.v1094242.mov - a11.v1092338.mov - These black and white videos, blurry and drab, are presented when high-quality colour was relatively just as simple to employ. The technology to do so was available in 1969.
a17f.landing.mov As the LM is landing, there is negligible instability due to surface effects from all of the engine exhaust. Also, no ground reflection or brightness in the shadow is apparent from any LM main engine flame as the LM lands. a17v.launch.mov The LM ascends with no flame, exhaust, or even engine exhaust shroud visible from its bottom. MPEG video and RealVideo clips are downloadable at the Multimedia link at http://www.apolloarchive.com . In the Apollo 11 5492 KB MPEG video clip, with description "Aldrin (with gold visor up) displays smudges on glove", the background ladder is visible behind the glove and arm which appear as a "ghost" image. In the Apollo 11 8222 KB MPEG video clip, with description "Aldrin demonstrates lunar lope and kangaroo hop", the background LM and flag are visible behind the astronaut which appears as a "ghost" image. In the Apollo 15 12974 KB RealVideo clip, with description "Scott and Irwin deploy the Lunar Rover", the axle and wheels of the rover just seem to pop out, or "explode", out of a space too small. The astronaut is unusually flexible compared to today's shuttle astronauts on EVAs; the Apollo suit does not appear to have bearings at the joints like the space shuttle extra vehicular suits. The experimental thermal samples flutter and follow non-linear curved paths, as if under the influence of or affected by atmospheric drag and turbulence. No ground reflection or brightness is apparent in the shadow from any LM main engine flame as it lands. No ground reflection or brightness is apparent in the shadow from any LM main engine flame. The astronaut jumps not more than a couple of feet after flexing his knees to a fair degree. As the LM ascends, no flame, exhaust, or even engine exhaust shroud is visible from its bottom. The following is what I have discovered to date from images located at http://science.ksc.nasa.gov . AS14-64-9103 10075623.jpg The rock-strewn highly textured foreground is separated from a smooth blurry background with a relatively straight and abrupt transition. AS14-64-9118 10075624.jpg Same as the above. AS14-66-9277 10075610.jpg Bootprints make marks in the undisturbed dust not blown away by the LM main engine. AS14-66-9306 10075611.jpg This photograph appears to be taken directly of the sun. The sun appears to be shining through the LM. The shadow side of the LM is relatively well-lit and the words "UNITED STATES" and other details are easy to distinguish. No detail can be distinguished on the ground in the shadow. Optics in this image are strange. AS14-68-9414 10075628.jpg The foreground is textured and rock-strewn, while the background is blurry. The two are separated by a relatively straight and abrupt transition. AS14-68-9448 10075629.jpg The drab and out-of-focus background has a darker colour than the foreground which is in focus and has high detail. The foreground is separated from the background by a relatively straight and abrupt transition. Shadows of the rocks in the foreground are nonparallel. AS15-82-11082 10075728.jpg A straight transition separates smooth background hills from a richly-textured and rock-strewn foreground. AS15-86-11602 10075735.jpg Dual parallel straight lines are found before the background hills. The flag and the words "UNITED STATES" are relatively easy to see on the dark shadow side of the LM. AS15-86-11603 10075736.jpg The sun's glare above the astronaut, which would indicate a sun position above the astronaut, is not consistent with the shadows. The plain ends in an unusual abrupt straight line before the background hills and their shadows. AS15-88-11866 10075742.jpg A straight line behind the astronaut separates a brighter area from a darker area. The flag and the words "UNITED STATES" are easy to see on the dark shadow side of the LM. AS16-117-18825 10075862.jpg The foreground is light and textured, while the background is darker, drab and smooth. They are separated by a relatively straight transition. Unlike the astronaut, the rover is not casting a shadow. The shadow side of the helmet is very bright. AS16-116-18678 10075859.jpg The foreground is highly-detailed and rock-strewn while the background is smooth and featureless and has no visible rocks. AS17-134-20426 10075955.jpg A photographic defect line occurs right at the hill/plain transition. Hills are a lighter shading than the plain. AS17-134-20435 10075956.jpg The plain is a different colour and texture than the background hills. The ground is really bright near the shadow of the head of the astronaut taking the picture. AS17-134-20476 10076013.jpg The plain/hill transition is very straight. The colour and shading change is abrupt and non-gradual at this transition. AS17-137-21011 10075963.jpg A very straight unnatural-looking line is found at the horizon before the hills. Left hill incline is also very straight. AS17-140-21388 10075971.jpg The plain-hill transition is very straight and noticeable due to the abrupt shading change. AS17-140-21494 10075972.jpg A very long and very straight line divides the background hills from the flat plain in the foreground. AS17-140-21496 10075973.jpg Same as the above. AS17-145-22157 10075964.jpg The hill-plain transition is relatively straight and is featured by an abrupt shading change. The plain has high-contrast features whereas the background hills are drab and low-contrast. AS17-145-22165 10075965.jpg The hill-plain transition is relatively straight. The plain is highly-detailed and textured whereas the background hills lack this detail and texture. A photographic defect line occurs right at the hill-plain transition. AS17-145-22183 10075966.jpg A dark foreground is abruptly separated from the lighter-coloured background hills by a relatively straight transition. AS17-147-22523 10075949.jpg The hill on the right side is a vastly different colour than the foreground. The hill-plain transition is marked by a colour and texture change running in a straight line. AS17-147-22526 10075950.jpg Same as the above. S73-22871 10075974.jpg Two parallel horizontal lines run completely across the image just before the hill-plain transition. The background hills in the following three images are inconsistent with background hills in 360-degree pans showing the LM. The following two images (the second has higher resolution) show the LM as seen from Station 6, with the "Pluton Crater" in the background. This post-EVA-3 pan, http://www.hq.nasa.gov/office/pao/History/alsj/a15/a15.pluton_pan.jpg, is taken looking out through an LM window and shows the same surface features on the background hills as in the previous two images (the frames are AS15-82-11204 to 11217). Compare the background hills in the three previous images with the following 360-degree pans. This 360-degree pan, http://www.hq.nasa.gov/office/pao/History/alsj/a15/a15.1472712pan8.jpg , is taken right next to the LM at the end of EVA-2 (the frames are AS15-87-11822 to 11840). A VR version of this pan is available. This station 8 pan, http://www.hq.nasa.gov/office/pao/History/alsj/a15/a15pan1480225.jpg, also shows a 360-degree view in the LM vicinity (the frames are AS15-92-12420 to 12438). The background hills in the first three images showing the "Pluton Crater" do not match the background hills in the 360-degree pans. 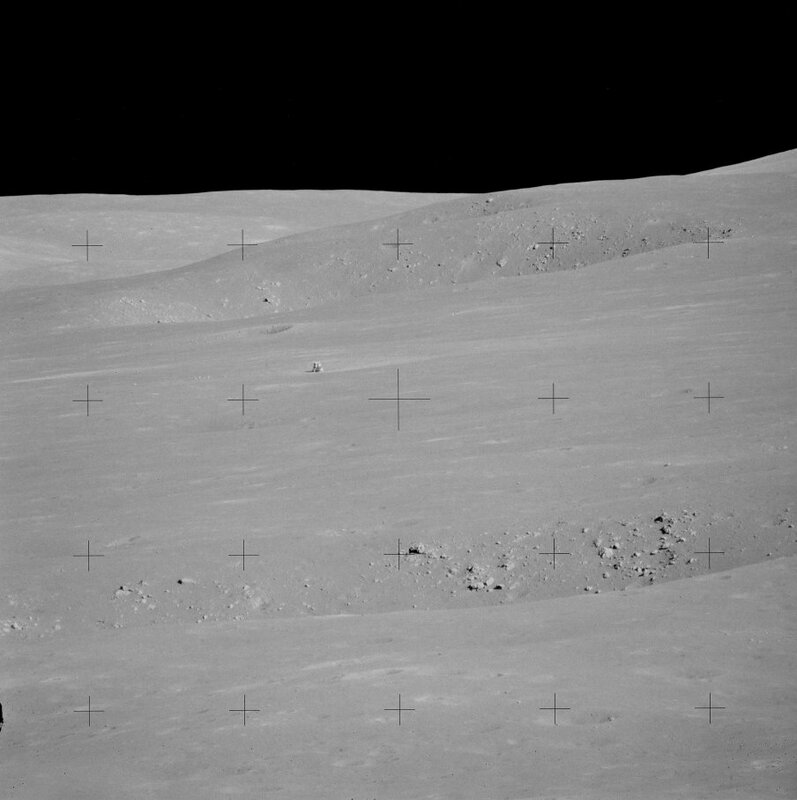 An unusually bright white narrow strip runs along the horizon in these Apollo 17 station 6 and 7 pans.